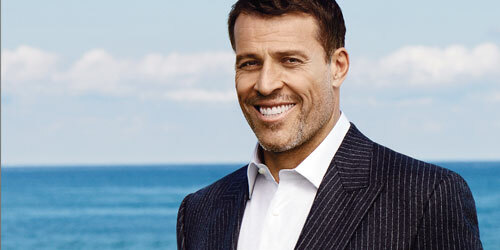 Tony Robbins, who has counseled Bill Clinton, Oprah Winfrey and scores of top business leaders, is six-feet seven-inches tall. His success as a coach, business strategist and best-selling author, however, measures considerably higher. Best known for leading personal-development seminars, the 56-year-old entrepreneur is chairman of a holding company of 18 diverse businesses that score more than $5 billion in sales yearly. He’s now stepping into the financial services arena, where he advocates for hiring financial advisors who abide by the fiduciary standard of care – that is, recommending investments in the client’s best interest – rather than brokers held only to a client “suitability” standard. In a new business venture with wealth management firm Creative Planning, Robbins is also training advisors to design financial plans that address clients’ psychological needs around money. You can get a behind-the-scenes look at one of the coach’s annual six-day seminars, “Date with Destiny,” when the documentary film, Tony Robbins: I Am Not Your Guru, premieres July 15 on Netflix. (The next live event is scheduled for Dec. 8-13 in Boca Raton). A Southern California native who grew up poor, Robbins is also a philanthropist who shares his wealth to feed, shelter and educate millions of the impoverished. He makes his home now in Palm Beach. City & Shore: What do you like best about living in Florida? Tony Robbins: I get so much joy from going in the pool every day, getting into the ocean and sitting on the sea wall taking in the sky. In Palm Beach, the blessings are everywhere. Gratitude flows easy here in South Florida. C&S: You’re now a consumer advocate educating investors. What’s the biggest self-sabotaging mistake they make? TR: People get fearful, and they get greedy. So they sell when they should buy and buy when they should sell. C&S: How can you help someone become a better investor? TR: By showing them, for example, broker conflicts of interest and loopholes in the law. People have no clue. It blew my mind to find out that 67 percent of Americans think they aren’t paying fees on their 401(k) plans. All the fees are hidden. C&S: You help CEOs turn their companies around. Do you do that by motivating them? TR: I’ve never been a motivator. I’m a strategist. I help diagnose business owners’ challenges. This isn’t motivational BS pump-up. If you think people pay me seven figures a year plus a piece of the upside to motivate them, you’d better take a look at who I’m working with. C&S: You grew up poor, often without food money. Are there lingering effects of that deprivation? TR: It’s given me tremendous drive to help people as much as I can. When I see someone hurting, I’m compelled to do something about it. I don’t want to wait till I die to make a difference.